I missed it by minutes. Honda were performing a TV ad live tonight on Channel 4 - a first for British TV. 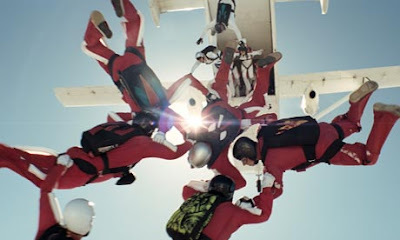 The ad was due to feature a team of skydivers leaping out of a plane over Madrid, as part of their latest "Difficult is worth doing" campaign. Great idea. I wonder how they got on. I couldn't find it on youtube but I maybe I'll give them an hour or two to upload it. More info at Guardian.co.uk - where I also stole this picture above from. Here's my take on it - I have to admit it was pretty breath-taking . . .
hi Tamsin, thanks for that. Love that idea that we generally watch tv shows and are exposed to ads, while in this case you were exposed to the tv show cause you wanted to see the ad. Last time people did that was probably the Levi's ads of the 80/90s?